And I thought I was lazy! I am the last person you can expect to ask you to take a walk. Heck, if I could fit into those little trolleys for kids at the mall, I would rent one so I wouldn’t have to walk around. If I can do things the easy way (i.e., not walk), then I would. Reading about “The American Dream,” a project by Stephen Shaffer and his friends. The American Dream is a hammock which you can use to get around – not only in your backyard, but practically anywhere in town! Using The American Dream, you do not have to walk or drive a car – which can also be a hassle for some people. Instead, you just lie there as if you were enjoying the scenery at a tropical beach. It doesn’t matter – you are in a hammock, the most relaxing thing ever made. DIY at its best! If you didn’t know, the hammock was invented by the Mayans eons ago. 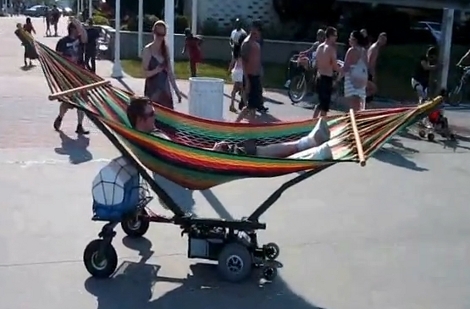 Stephen and his friends took it upon themselves to make an improvement on the hammock by putting it up on wheels. They threw in an Arduino micro-controller and used a PS2 controller for the navigation system. The chassis is from a wheelchair. See, this thing is not only convenient (although it does take time and effort to build), but it also helps in the battle for the environment by using recycled materials! Here’s the hammock in action, plus some details about its creation. By the way, you have space for some luggage in the back. And that Red Bull trailing behind the hammock tells us that this was created for a Red Bull-sponsored competition. Thumbs up, boys! American dream, Making the segway look like hard work from vimeo user on Vimeo.